The Meter Man now stocks the Filips Folding Plate Pasture Meter. 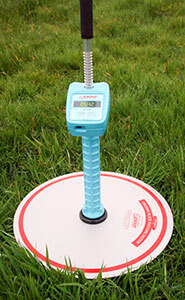 The folding plate pasture meter is used for measuring the amount of pasture in your paddocks. The rising plate principle allows the meter to measure the average height of the pasture, allowing for any variations in pasture density. 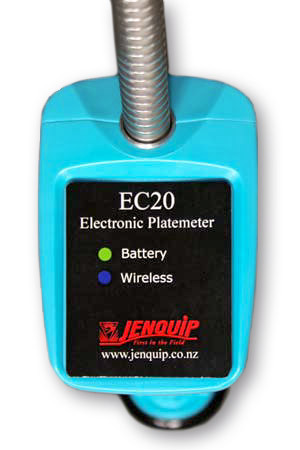 The Jenquip electronic plate counter simplifies the use of the Rising Platemeter by automatically recording each reading and instantly displaying the results. Readings can then be converted to an amount of Dry Matter (DM), ready for use in feed budgeting. The meter's plate is calibrated for weight and area. During use the plate is supported by the pasture. The taller and denser the pasture is, the further off the ground the plate sits. 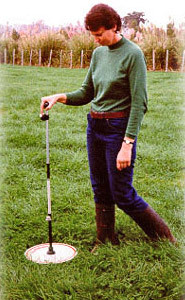 The shaft of the meter drops through the pasture to rest on the ground. The bottom counter records the position of the plate relative to the shaft, totalling the readings as each sample is taken. A sample counter at the top of the meter is used to record the number of samples taken in each paddock. The sample counter can be zeroed. Usually 30 to 50 samples are taken in each paddock, and a simple formula converts the average reading into an assessment of dry matter per hectare (or acre). Bluetooth platemeter, complete with Android App using proven equipment technology, for each use and data management. Can be retro-fitted to most brands of platemeters. Displays individual and average reading. Please note: The model EC09 does not have USB download. All other features are the same. Instant readout of pasture cover and height. Enter and select different formulas. The formula will not change until you change it. Retains records even when switched off. Ball knob at top to help prevent rolling of meter. Durable alloy plate. Easy to keep clean so water and dirt won't add to the weight of the assembly. Meter folds in half for ease of storage or transport. Supplied with free computer software. The software is supplied on a CD for use with MS Windows XP and later versions. On request we can supply software for earlier MS Windows versions. Cost effective. Using feed budgeting, increases in efficiency can pay for the electronic platemeter in just a few weeks. Features the new patent-pending case on all mondels that displays information at a more easily viewed angle, with the advantage of being able to view readins while using the platemeter. This eliminates the necessity of having to lift up the platemeter risking the change of an incorrect reading. Unique design ensures that calibration is not lost due to counter movement on shaft. Contact the Meter Man, David von Pein, about this innovative, time-saving pasture meter.